Versions: Recorded with Access 2013. Also use with 2007 and 2010. The lessons on embedded macros are valid for Access 2007 and later only. 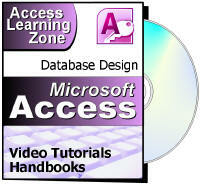 Access 2003 users should get Access 222. This class picks up where Expert Level 14 left off. In Level 14 we started learning about Append Queries. In today's class we will learn two more great examples of when to use Append Queries. First, we'll begin with a very popular request: tracking student attendance. We'll set up a list of classes, and put students into those classes. 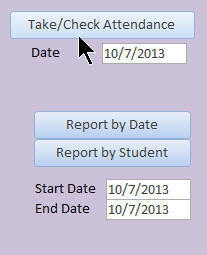 Next, we'll create the student attendance table and a form for entering daily attendance. Then, we'll create an Append Query that will take all of the students and add them to the current day's attendance automatically. 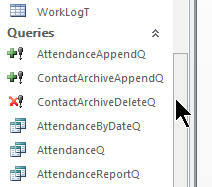 We'll put a command button with an embedded macro on the attendance form to run this query, turning off all system warnings (temporarily) and then requery the form results. Now, all the instructor has to do is check the box indicating which students are absent. We will create a button on the Class form so that the instructor can take attendance for ANY date. This way if he forgot to take attendance yesterday, or perhaps wrote it down on paper, he can go back and enter results from other days. We'll also set up a couple of attendance reports. The first report shows each class, grouped by DATE, sorted by student. 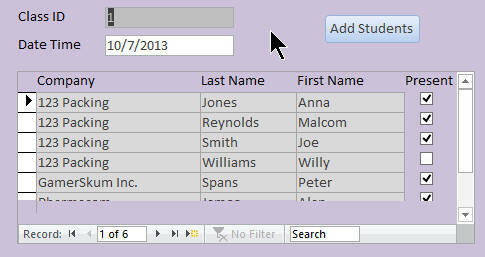 This allows you to easily see who was absent from each class on each date. The next report is similar, but is grouped by STUDENT, so you can enter a range of dates and see how many days that student was absent in that date range. Next we'll learn about Delete Queries. Use can use Delete Queries to remove data (delete records) from a table. They're very dangerous so make sure to back up your tables first. We will create an Append Query to copy old customer contacts from the Contact Table to a Contact Archive Table, and then we'll Delete them from the Contact Table. This is the 15th class in the Access Expert series. There's a lot of great material in this class. Learning Action Queries will add tremendous power to your databases. Of course, if you have any questions about whether or not this class is for you, please contact me.